A teacher in Port St. Lucie, Florida claims she was fired for refusing to give students partial credit for work that is never handed in. “I got fired. I was packing my stuff, and I was not going to see the kids,” Diane Tirado said. 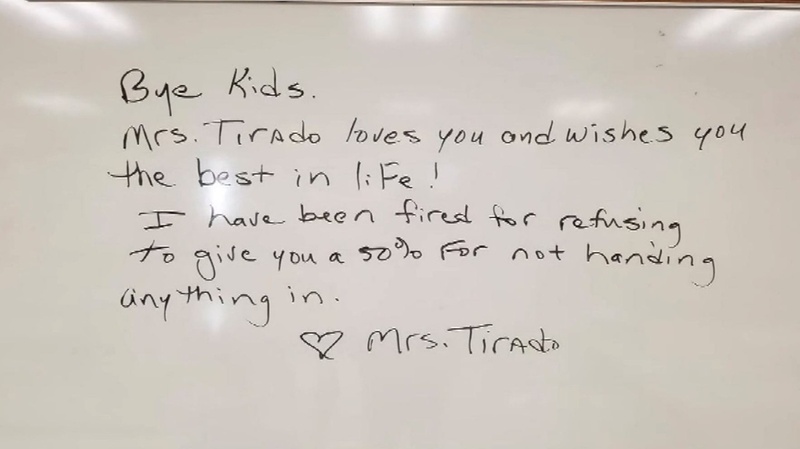 Mrs. Tirado didn’t get to say goodbye to her student physically, so she wrote her message on a whiteboard instead. She snapped a photo of it and shared it on Facebook. Then, the messages from her eighth-grade students started pouring in. “You showed me to be responsible for my work and the things that I do. I hope you don’t forget me,” one student wrote. Mrs. Tirado has been a teacher for more than 17 years. The 52-year-old began working at West Gate K-8 School this year as an eighth-grade social studies teacher. She says she gave her students two weeks to complete an explorer’s notebook project but says some of them didn’t turn it in. Tirado says this sends the wrong message. “If there’s nothing to grade, how can I give somebody a 50 percent?” she asked. Her Sept. 14 termination letter doesn’t cite a specific reason, only stating she was contracted as a teacher on a probation period, and that she can be dismissed without cause. 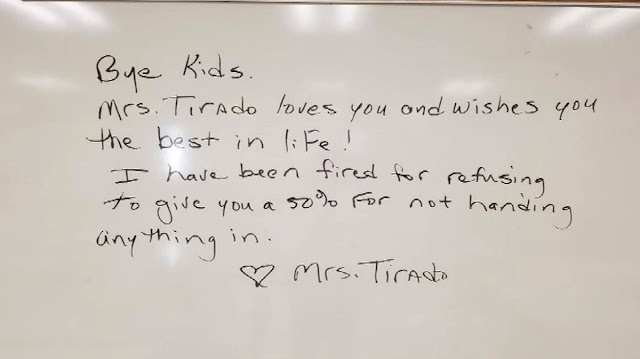 Her message on her classroom’s whiteboard has been shared hundreds of times, with messages from other parents and teachers congratulating her on standing her ground. Tonight, she is calling for change because she believes the grading policy at West Gate K-8 School won’t help students in the long run. “I’m arguing the fact that you don’t get something for nothing. I want the policy changed, and it’s not just here,” she said. There are zeros found in the grading scale above the “no zero’s” wording on the West Gate Student and Parent Handbook, which adds confusion, Tirado said. WPEC is still waiting to hear back from St. Lucie Public Schools as of late Monday night.